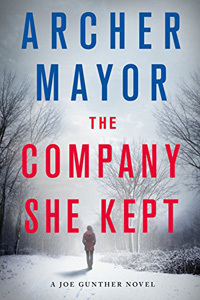 The Company She Kept by Archer Mayor, a Mysterious Review. Review: Joe Gunther and the Vermont Bureau of Investigation team are called upon to assist in the investigation of a particularly brutal crime, in The Company She Kept, the 26th mystery in this series by Archer Mayor. Joe Gunther is just where he wants to be, Field Force Commander of the VBI, able to travel the state to be where he's needed when he's needed. That is certainly the case here. On a very cold, wintry day, a woman's body is found hanging from a retaining net lining a cliff along a Vermont interstate highway. The word "DYKE" is cut into her chest, giving the first impression that this is a hate crime. The dead woman is Susan Raffner, a state senator and a close friend of Gail Zigman, the current governor of Vermont. Joe, also a close friend of governor, had met Raffner at social functions, but really didn't know her. Zigman asks Joe to be involved with the investigation, which is headed up by the Vermont State Police. Was this a hate crime? Or was it intended to embarrass the current administration? As Joe begins his own investigation, he has far more questions than answers. Who was Raffner involved with? Is her murder personal or politically motivated? And why kill her? What does the killer hope to gain from it? This is an electrifying mystery, centered on homophobia, drugs, and politics. The investigation into Susan Raffner's murder is hampered to some degree by the two organizations assigned to it, adding a layer of competitive intrigue to the story. Joe Gunther is an engaging series character, well-defined and approachable to new readers and comfortably familiar to fans of the series, which seems to improve with every outing. With a strongly developed and compelling storyline, The Company She Kept is highly recommended. Special thanks to guest reviewer Betty of The Betz Review for contributing her review of The Company She Kept. Acknowledgment: Minotaur Books provided a copy of The Company She Kept for this review.